Colt Model 1911A1 Serial Number 713239 1938 Contract - This is one of 1,296 pistols produced in this contract. It was in a shipment of 350 pistols shipped on July 23, 1938 to the Commanding Officer, Springfield Armory, Slide has a matching serial number. Close-up of left side slide marking. 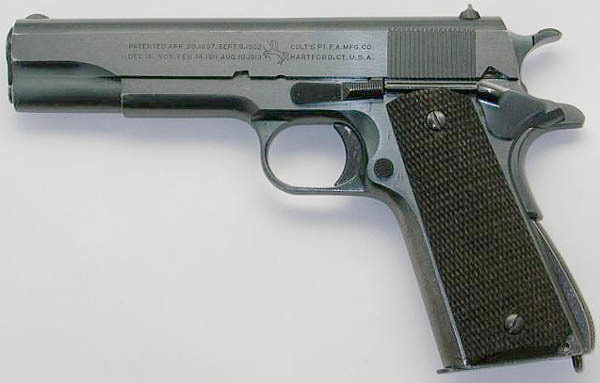 All pistols in this 1938 contract beginning with serial number 712350 were roll marked with "M1911A1 U.S. ARMY" designation. 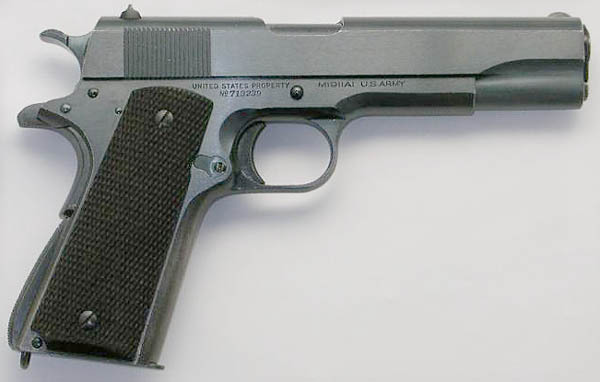 The "MODEL OF 1911 U.S. ARMY" was eliminated from the right side of the slide. Pistol is "P" proofed on top of the slide in front of the rear sight and above the magazine catch. Also note the "H" inspector's initial of Frederick W. Hauff on the left side to the right of the magazine catch. This was applied upon final ordnance inspection. P proof on top of the slide forward of the rear sight. Colt "VP" Verified Proof mark on upper left flat of the trigger guard.